Not offered in Costa Rica. Alternatives offered are All-on-4, All-on-6, and All-on-8 implants. Fixed dentures are preferred over removable ones because the former have a better feel to them, look more natural, and also help prevent bone loss. In countries like the United States and Canada, they can be quite expensive. 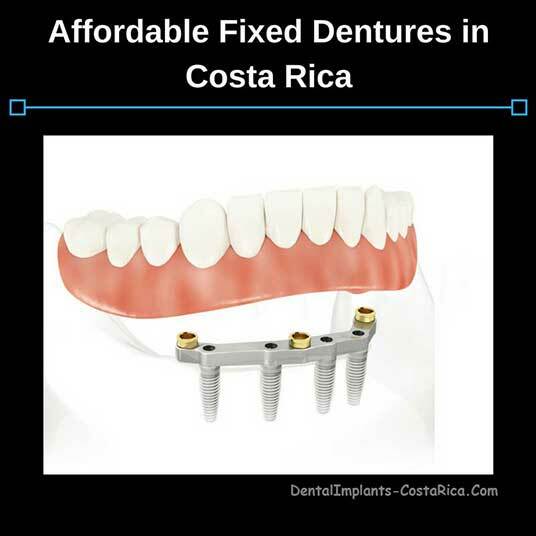 However, one can get hold of fixed dentures in Costa Rica where they are available at almost 70% lower than US prices. Also known as permanent dentures, they are used to replace missing teeth for the purpose of restoring one’s chewing ability and for aesthetic enhancements. These are permanently cemented to the natural teeth or dental implants, and hence not removable. You could come to Costa Rica for a permanent dentures trip, have an extraordinary Central American vacation, and still return home having saved up to 70% compared to what you would most likely spend at American or Canadian clinics. 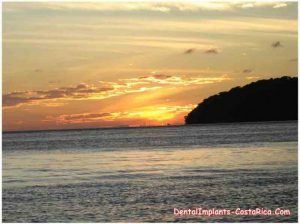 *Cost of 12-14 unit fixed denture/bridge topped on an All on 6 or All on 8 Implant in Costa Rica. Prices are subject to change without notification. Contact us now for more information and FREE Pricing. How much do Fixed Dentures Cost in the United States? The price of implant supported dentures ranges between $30,000 and $50,000 in the United States. As is apparent from the table above, you save big dollars by having your procedure in Costa Rica. Fixed partial dentures, alternatively known as dental bridges, are for those who have lost only a few teeth. During this procedure, dental crowns are placed over two teeth on either side of the gap with artificial teeth in between. They are used when a person has lost all of their teeth. In these, dental implants are used to support the artificial teeth. Fixed dentures are available in different types of material including porcelain and porcelain-fused-to-metal. Did you know: Fixed dentures help augment smile and facial appearance that are marred by gaps in their jaw. Why Go For Fixed Dentures Over Removable Ones? Studies have shown that fixed dentures are a better option for your overall oral health than removable partials. According to the American Association of Oral and Maxillofacial Surgeons (AAOMS), teeth adjacent to removable partial dentures have a 30% failure rate within five to seven years of the false teeth being installed. Fixed dentures do not cause this collateral damage. Removable dentures can become ill-fitting with use, and then tend to slip while speaking and eating. This can not only create problems in chewing one’s food but also lead to social embarrassment. There are no such issues associated with fixed dentures as these are designed to settle permanently on the person’s jaw. Fixed dentures are more stable and comfortable than their removable counterparts. 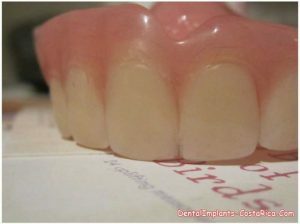 Implant support in a fixed denture is something that can be opted for by people who have worn down jaw ridges as well. Our network dental clinic in Costa Rica offers excellent dental care. This procedure is carried out by experts who have a lot of experience treating patients from numerous countries. The advantages far outweigh the fact that fixed dentures cost more than removable dentures. 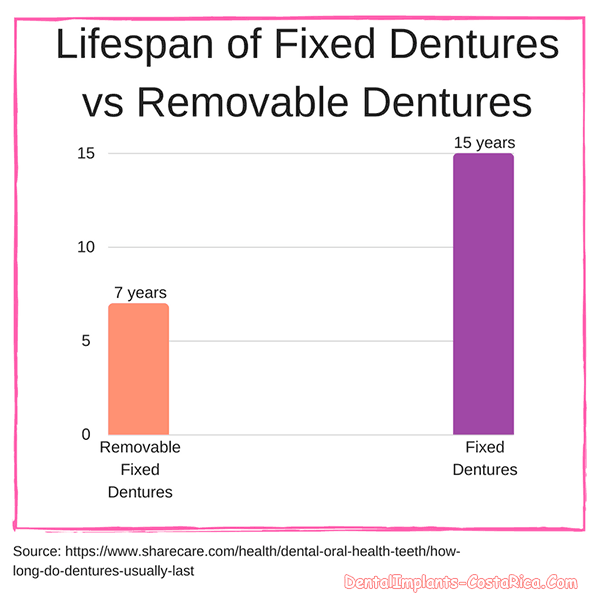 Fixed dentures are a onetime investment with high returns. You get to feel comfortable; you regain your smile and confidence! Will My New Dentures Create Problems while Eating? Fixed dentures will create some uneasiness initially, but you will soon start accepting and using them like your natural teeth. It is only a matter of some days before you can eat all types of food. Did you know: With fixed dentures, you have to avoid chewing extremely hot, cold, hard, and sticky food to prevent damage and discomfort. With adherence to a strict oral hygiene routine, fixed partial dentures can easily last as long as natural teeth as they are fixed to remain sturdy. Seek your dentist’s advice regularly to maintain the health of your fixed dentures and gums. Ask them to demonstrate how to brush and floss your teeth properly in order to ensure their cleanliness and durability. 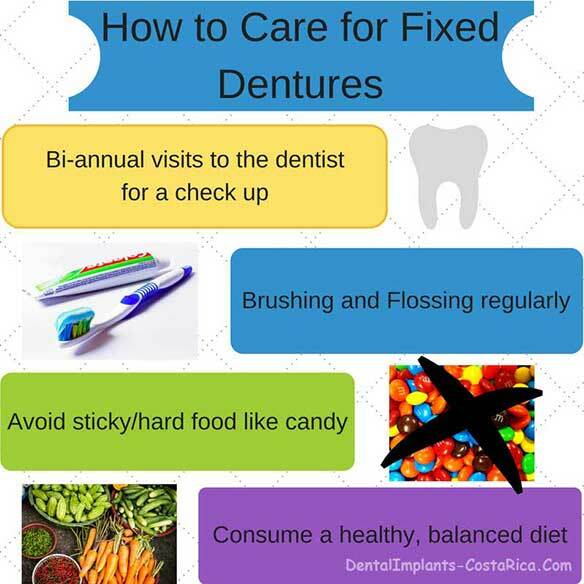 How to Take Care of Fixed Dentures? Bi-monthly visits to the dentists are a must as these help keep a check on the health of the denture. Brush and floss religiously. 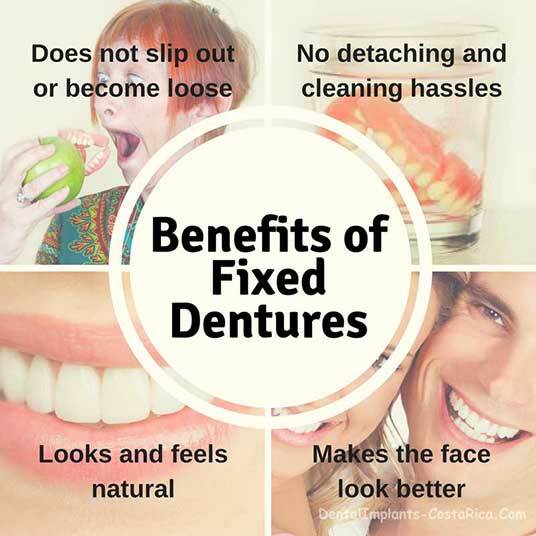 Treat the fixed denture like your natural teeth. Avoid eating hard and sticky food like candy. Eat healthy and make sure you consume a balanced diet. One of the biggest perks of taking a dental holiday in Costa Rica is the country’s surfeit of picture perfect beaches. Unless you have a lot of time to laze in the equatorial sun, you should probably choose one or two that you like the best. Why Choose Our Dental Center in Costa Rica? The dental center in San Jose, Costa Rica we work with is easily accessible, has hotels nearby, and is only 11 miles from the international airport. The clinic has an experienced set of dentists, dental assistants, on-demand specialists, and surgeons. All the doctors are affiliated to American Academy of Implant Dentistry (AAID), Colegio de cirujanos dentistas de Costa Rica, the American Dental Academy, and the International Congress of Oral Implantologists (ICOI). The dental clinic has also been internationally accredited by the American Association for Accreditation of Ambulatory Surgery (AAAASF), and locally accredited by PROMED. All the latest technologies are used and extra care is taken to maintain an excellent standard of hygiene. So if you’re ready to no longer worry about your missing teeth, prepare for getting inexpensive fixed dentures in Costa Rica, and you will return home with a huge, brand new smile on your face. For more information and FREE Pricing, please fill the website quote form. Mukatash GN et al “Implant-Supported Fixed Dentures Vs. Implant-assisted Over-Dentures: A Prospective Study of the ability of Prosthetic Rehabilitation in the Mandible to Achieve Patient Satisfaction” International Journal of Dentistry and Oral Science (IJDOS) ISSN: 2377-8075 Accessed 28 Dec. 2017.